The Portuguese press is extremely glad Wolverhampton Wanderers should be keeping their Portuguese stars at the club for the next season. This is the second consecutive day when all the local newspapers have a story about Wolves. On Monday, they all covered the promotion to the Premier League, giving a big credit to the Portuguese influence on the squad. Now today, as the outlets put their sights on next season, they take the latest news to show that Ruben Neves and his mates are not done at the club. Newspapers O Jogo and Record both take the midfielder’s quotes from the interview with The Guardian, in which he said he isn’t interested in leaving Wolves now. Both papers have given an entire page to it. What A Bola does is to give credit to each Portuguese player in the squad. Manager Nuno Espírito Santo and his players Ruben Neves, Roderick Miranda, Ruben Vinagre, Helder Costa, Diogo Jota and Ruben Cavaleiro all have their stats detailed. 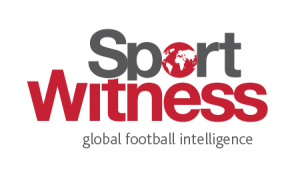 Willy Boly, who is on a loan from FC Porto, and Leo Bonatini, who previously played for Estoril, also get a mention. But not only players and manager are remembered. A Bola claims it all started with agent Jorge Mendes, who handled the Fosun takeover a season earlier, and even helped to bring some early signings to the squad: Sílvio, João Teixeira, Ola John and Helder Costa. From these four, only the later has managed to stay. A Bola also take Neves’ recent quotes about his future, but recall that Diogo Jota is also expected to stay at the club by moving permanently from Atletico Madrid. 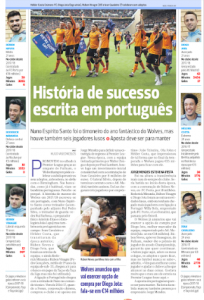 With this projection, A Bola writes that ‘the plan seems to be maintained’, as the story of the Portuguese squad at Wolverhampton is still not done.